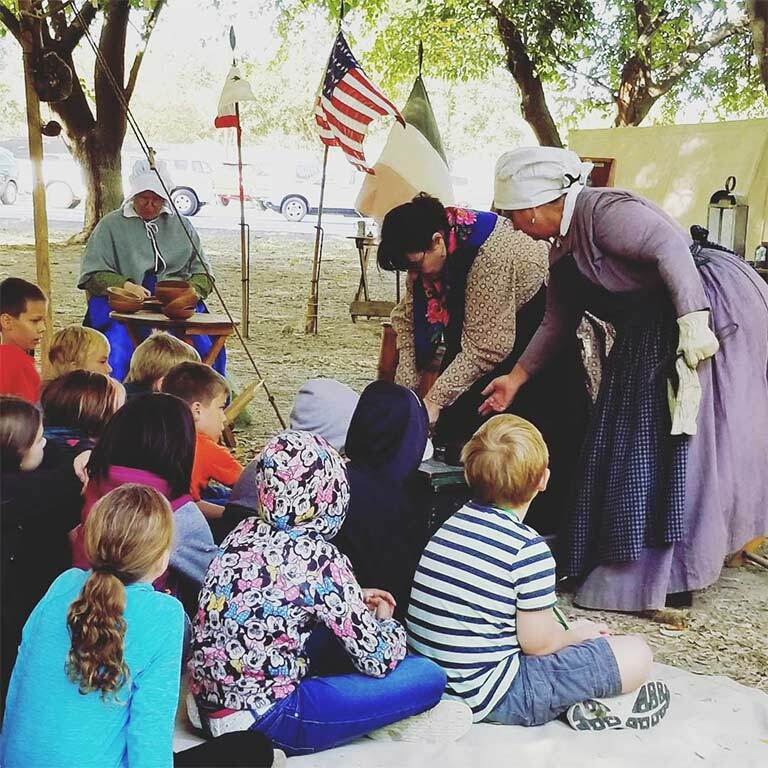 Friends of Sutter’s Fort is proud to be the sponsor of the Trapper’s Camp Mobile Learning Program, which brings educational experiences from Sutter’s Fort State Historic Park to Colusa and Red Bluff. This program has been delighting students and teachers since the 1980s! During our Trapper’s Camp Mobile Learning Program students are “transported back in time” to an 1840’s fur trapping camp along the Sacramento River. The presenters will be in clothing appropriate to the period, and will generally act as if they are actually in 1846. At both the Colusa and Red Bluff sites, we present the students with the idea that they will be walking back in time as they move from their buses to the camp. Students will experience four interpretive stations that make up the complex operations of the camp. Presenters at each station are highly trained and experiences volunteer docents and staff from Sutter’s Fort State Historic Park, who take on personas of individuals from the 1840s. Each station will provide students with an opportunity to learn about history, science, technology, engineering and math. Trapper’s Camp also teaches students about the political changes taking place in California including the Bear Flag Revolt and the Mexican-American War. Each session of Trapper’s Camp can accommodate up to 300 students, which means that several schools participate in one session. Each Trapper’s Camp experience takes less than 2 hours (roughly 1.75 hours). After Trapper’s Camp, students may explore the on-site Trapper’s Camp store (cash only!) or picnic on the park grounds. The cost to participate in Trapper’s Camp is a $4.00 for each person (students and adult chaperones). No fee is required for teachers or bus drivers. The program is available to public, private, and home school groups. The program is limited to elementary school students. The Trapper’s Camp at Colusa is in a public park with grass, trees and picnic tables/benches. The Red Bluff Camp is a more primitive site that requires a quarter mile (1/4) walk down a bumpy and dusty (or muddy) dirt road (wear appropriate shoes). Trapper’s Camp takes place rain or shine. All attendees should come dressed appropriately for an outdoor presentation. In previous Octobers, we have encountered both 1000 heat and pouring rain. Trapper’s Camp 2018 is completed- watch for future updates about Trapper’s Camp 2019! To secure your spot, payments for your group may be made online, or checks should be made out to Friends of Sutter’s Fort. Because the cost is per person, any additional students in attendance over and beyond your registration can be paid via invoice after the program. Please note that no refunds will be provided once your session has been secured. We ask groups to choose two dates and times that would work with your schedule. We will make every effort to accommodate your first choice. However, session times are assigned on a first come, first served basis. Private and Home Schools, or any schools providing private transportation are encouraged to use afternoon times, as the morning sessions are filled by public schools relying on busses. Sessions are designed to accommodate up to 300 students so we often have to combine schools – especially in the morning sessions. Maps and directions to the event sites will be mailed along with your confirmation letters and details about preparing for your trip. In 1983 volunteers from Sutter’s Fort became enamored with the lives of the 19th Century trappers. The volunteers wanted to see how closely they could live like real trappers. In the yard of Sutter’s Fort they built their dugout canoes from native trees, hauled the canoes to the river, and launched their journey north. Newspapers wrote stories of the trapper’s adventure and at each stop more and more people came to the trapper’s camp to see them and how they lived. It didn’t take the volunteers long to realize that the moving trapper’s camp was a wonderful way to bring the educational programming of Sutter’s Fort to schools and families that might not be able to take a field trip to the Fort. And, Sutter’s Fort Mobile Living History (Trapper’s Camp) was born. The number of volunteers participating and the quantity of equipment used for visitor activities long ago outgrew the dugout canoes. It now requires a large moving van and several people all day to set-up camp in the two locations. Each location has easy access and ample parking to accommodate the more than 3,000 students and families that attend Trapper’s Camp each year. The Mobile Living History is now a cooperative effort of California State Parks, Friends of Sutter’s Fort, the U.S. Forest Service, and the City of Colusa. 3.3 Students draw from historical and community resources to organize the sequence of local historical events and describe how each period of settlement left its mark on the land. 4.2 Students describe the social, political, cultural, and economic life and interactions among people of California from the pre-Columbian societies to the Spanish mission and Mexican rancho periods. 5.8 Students trace the colonization, immigration, and settlement patterns of the American people from 1789 to the mid-1800s, with emphasis on the role of economic incentives, effects of the physical and political geography, and transportation systems.